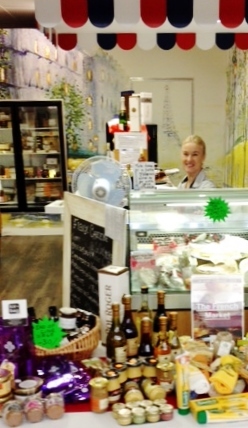 Visit us for fresh pâtés, saucisson, Rillettes and a wonderful assortment of pâté in jars that taste fantastic! We also have a range of other French products including herbs, mustards, jams, vinegars and marrons. Suzanne, whose passion for the taste of great French cheese hosted a stall every Saturday at the Old Biscuit Mill’s “Neighbourgoods Market” for 7 years, then expanded in 2012 to create a permanent retail store in Gardens Centre, Cape Town – called La Crèmerie. When you step into this French Market cheese shop, you might feel as if you have entered a shop in the heart of a remote French country village. French cheese reigns supreme in this beautiful shop and everyone is encouraged to taste the many varieties on offer. Take your time and savour the heady aromas of ripening French cheese which flies in from Paris each week. Shelves are laden with delicacies that you would typically find in a French kitchen such as mustard from Dijon, Tarragon vinegar, Crème de Marron, Puy Lentils, Piment d’Espelette, Herbes de Provence, Truffle products as well as Duck and Goose products to name just a few. La Crèmerie is the place to spoil yourself with traditional French delicacies. Suzanne who inherited her French Grandmother’s taste of fine French food, is always ready to share a recipe with you or to give advice on the right selection of cheese to go with your dinner or picnic. All of the cheeses, mustards and sundries that you find within the French Market have been carefully selected to ensure a wide range of flavours to suit all palates. Click here to get directions to the shop itself or contact Suzanne directly with any questions you may have.